Ricky Romero is the father of Mark Youngblood, Jay Youngblood and Chris Youngblood (and a 4th son named Rick). Ricky Romero was best known for being a huge draw in the state of Texas in the 1970s. January 15, 2006: Ricky Romero passed away at the age of 74 after years of complications due to diabetes. “Rapid” Ricky Romero passed away Sunday evening January 15, 2006 of natural causes. He was the Father of Jay, Rick, Mark and Chris Youngblood. Romero, was a catcher for the San Francisco Giants AAA team, but wrestling became his life. He wrestled in every major market between 1955-1980’s tagging with Pedro Morales (WWA) champions in Los Angeles, Terry Funk (NWA) Amarillo, Nick Bockwinkel (NWA) Amarillo, Rito Romero (W.W.W.F.). 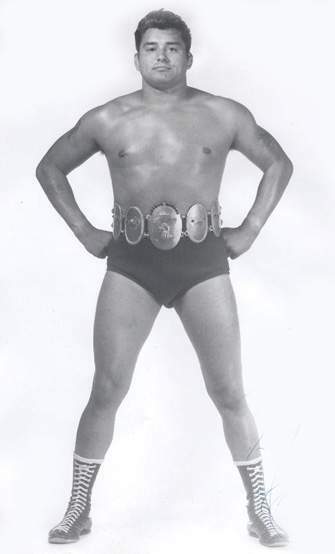 He got his huge break, when Dory Funk Sr. brought him into the Amarillo area during a time of segregation between races the young “SuperMex” broke attendance records as well as breaking racial barriers and became loved by all people, the first hispanic wrestler in the area that gained a top babyface spot. In 1972 he beat Terry Funk in a most popular wrestler contest in Amarillo, was a top draw for Gory Guererro in El Paso as well as for Fritz von Erich (Dallas) and Paul Boesh (Houston). He was such a top draw in the Rocky Mountain area (Colorado, New Mexico, Texas) that Dory Sr. invented the Rocky Mountain title just for Ricky which he retired in the early 80’s. Wrestled Lou Thesz, Gorgeous George, Wild Red Berry, and even defeated Jack Brisco in Lubbock, but the referee reversed the call. He was one of the first pioneers to work for Giant Baba and Antonio Anoki in Japan and had to were a mask (as Mexico Grand) to cover his truly handsome looks as a heel. He was dubbed “SuperMex” by PWI and several publications, he was truly the top draw in the Amarillo area and recieved his name “Rapid” by Dory Funk Sr. would listen to the hispanic fans call him “Rapido” for his cat like prowness and extremely quick style. He was trained by the best including “Iron” Mike DiBiase, Bob Geigel, Dory Funk Sr.. He kept in touch with some friends in the business such as Bob Orton Sr., Nick Bockwinkel, and Dory Funk. His sons gained fame in wrestling as the Youngbloods (mother is Apache Mescalero) and was preceeded in death by son Jay Youngblood who passed in 1985 due to pancreatic cancer, in Australia.